As for checking synergies, you might consider the Hextreme spreadsheet. Even if you don't use it for tracking a collection, the List Builder function can help you find, say, all Utgar Human Champions or what have you, at least from the official roster. 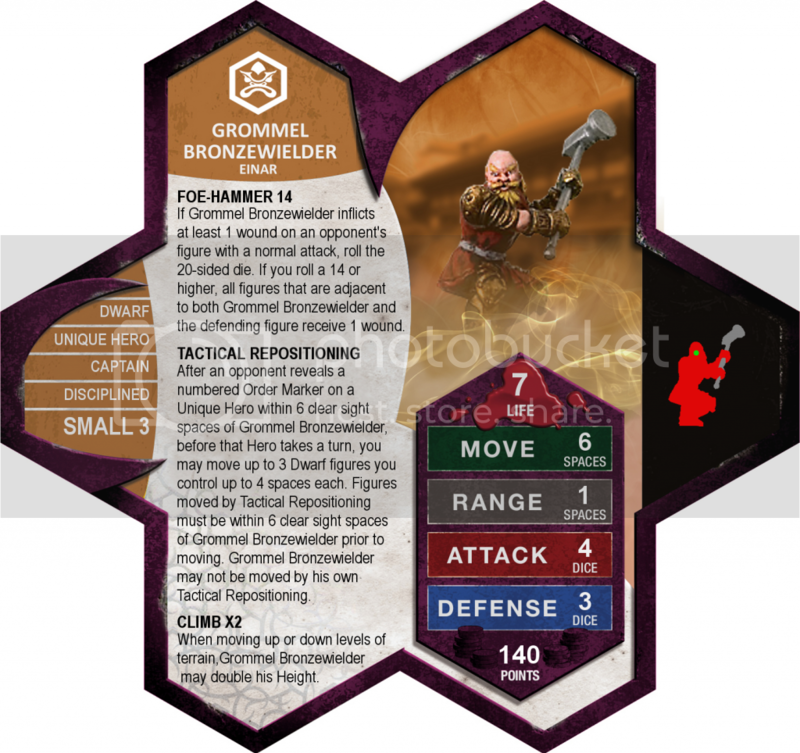 I vote to review Grommel Bronzewielder. I'm appeased by the new card. If there are other issues, we will catch them as we evaluate the new unit. Hey folks, we've got new cards. Go see them. Question on printing the high-quality cards (Have the same issue with the Samuel Brown card): What % do these have to be shrunk by to match actual army card size? If you're using the .pdfs, they should not need to be shrunk at all. I wish he followed Aquilla, but I guess I have the C3V to blame for a dwarf not doing so. I vote YES to review Grommel Bronzewielder. Grommel Bronzewielder by Son of Arathorn has received 4 Yea votes to review (Super Bogue, Scytale, capsocrates, and qt.bangerang) and moves on in the process. The Book of Cxurg'gyath is done and Tolamos is PMed. I'll give Tolamos one week from the time I PMed him yesterday to respond. If that is too long or not long enough, let me know and I will post it whenever the SoV desires. When I first saw the Wraith of Bleakwoode I thought it was an interesting design. When I sat down to play it, I realized it was less interesting than it first appeared. As a fast-moving hero the Wraith isn't bad for 100pts, but that's not why you draft it. You draft it to give improved survivability to your Shades of Bleakwoode. Shade Summoning gives all Shades you control an additional 40% chance of survival, with the penalty/bonus that the Shade is moved out of position. The Wraith by itself does not give as much value in an order marker as the Shades do, so you won't activate it until you're out of Shades. Actually, it's usually best not to activate it at all, as you want to keep it out of harm's way and starting zones are usually as safe as anything. On some maps it may be worth an early activation to move to a safer location, but that's about it. It's possible to move the Wraith closer to the front lines to have a closer point from which to launch Shades from, but that's risky since you don't want the Wraith to die until you get the most out of Shade Summoning. I should mention that the Wraith provides one tactical/gambling choice: Shade Summoning is optional. So you get the choice of whether to try for the Summoning role or let the Shade's fate be determined by defense dice. Four defense is reliable enough to shake off most 1-skull attacks, and it is often worth that gamble when sitting next to a hero. I did like that aspect. But for the most part, the Wraith's only purpose is to, essentially, increase the number of Shades you get per card. That's kind of neat, but for a unit that does not provide much else I find it somewhat boring. A neat custom, especially as part of a scenario, but not SoV material. I vote to induct the Wraith of Bleakwoode into the SoV. I suppose I'll post this again since Killo never did it... SB, could you change Priscus's card in the Display thread from Filthy's to the C3V version? My favorite way to play the Wraith was to attack heroes with him. Having him already in place to position Shades adjacent to the hero you are attacking with the Wraith. That's a possibility, but a painful one and hard to justify. Most of the Wraith's value is in his Shade-saving, which can vanish in a moment if you send the Wraith out to the front lines. Really, the optimal way to play him is to get the maximum use out of his Shade Summoning, which requires keeping him away from enemy fire. With the Shades as fast as they are, I found keeping the Wraith far away from the enemy was not really an issue for moving/attacking with Shades.